When summertime is here we like to make good use of the grill whenever we can. One of my favorite ways to cook potatoes is to grill them. Grilled potatoes are easy to prepare and the flavor profiles are endless. I like to grill small new red, white or yellow potatoes. I like their size and I like to grill them whole. I simply par-cook the potatoes in the microwave for about 5 minutes then toss them in olive oil and give them a sprinkling of kosher salt. Then I place them on the grill over medium low for about 10 - 15 minutes until they have nice grill marks. If they're cooked through you don't have to worry about under cooking them and you can let them get nice grill marks which equal flavor! For quick simple in a hurry preparation simply microwave for 5 minutes, toss in olive oil, sprinkle with kosher salt and then put on the grill for 10 - 15 minutes. Once the potatoes are cooked you can toss them in a wide variety of spice mixtures. Try using cumin, chili or ancho chili powders or a blend of several. Old Bay is another flavorful spicy mix. Perhaps you'd prefer traditional sour cream and chives. 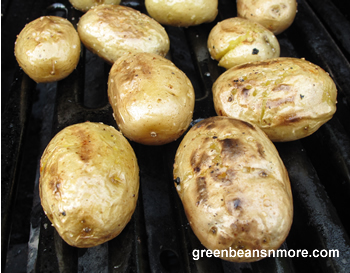 Toss your grilled potatoes in a mixture of herbs such as parsley, rosemary, dill, oregano and/or basil. Add a few teaspoons of parmesan cheese to add even more flavor!